I found this set of boy and girl twin baby bedding by Precious Moments quite by accident. I thought that it might be something that moms who are dealing with this particular decorating challenge might be interested in. Never having had twin boys or girls much less one of each; I have no idea what might be considered stylish. The colors of the boy and girl twin bedding set are very pretty and certainly seem versatile with many options for developing a unisex color scheme. sets suitable for fraternal twins in this and other colors and themes. but it's obvious that some imagination and creativity would be called for in choosing a baby nursery theme for twins. 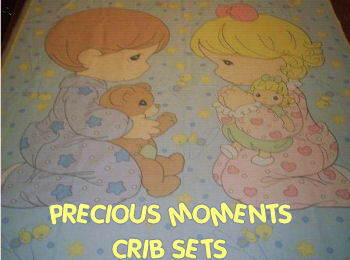 So I thought I would call your attention to this Precious Moments baby bedding set idea to see what you think. A Precious Moments twin crib bedding set for the nursery might not be every mom and dad's taste in decor but when I saw the picture of the little boy and girl saying their prayers on the crib comforter I thought that it might make a good boy and girl twin bedding set. I had not seen a Precious Moments theme for twins mentioned on Unique Baby Gear Ideas so I figured what could it hurt and it might just help! I am having a boy and a girl twins and I saw this post. I have to have it but no matter what I do I can not find the set. Can someone please help? Join in and write your own page! It's easy to do. How? Simply click here to return to TWIN NURSERY PICTURES.